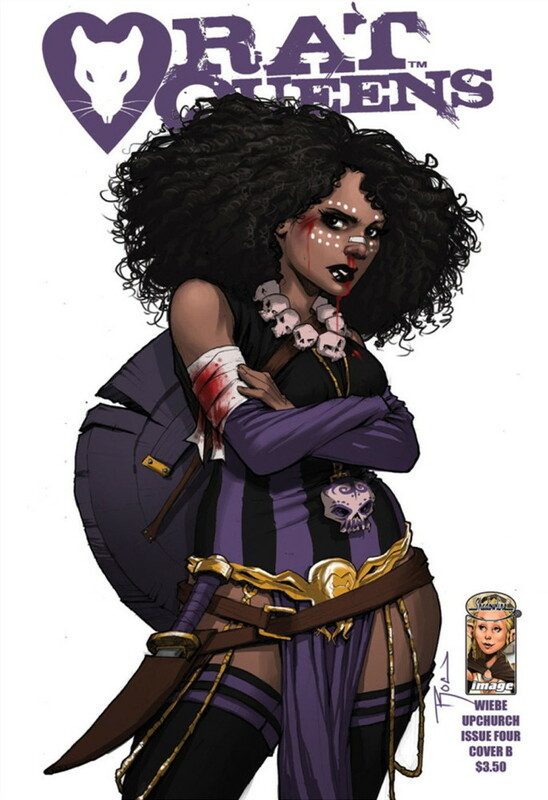 Rat Queens is one of a smattering of (seemingly) Dungeons & Dragons inspired comics I’ve read recently. It bears some similarity to Guilded Age in that both of them focus on what happens when a band of adventurers who make their living off of fighting and plundering tries to integrate into civilized society. In this story, the four women who make up the Rat Queens are one of several groups who draw the ire of the town’s leaders due to their drinking, carousing, and property damage. After being thrown in jail the groups are assigned “community service” in the form of being sent to clear out some nasty folks in the vicinity. But the groups find they’ve been set up to fail (and die); some groups don’t make it, but the Queens do and set out to find out who’s behind it. The story’s told with a modern sensibility, including modern language and cursing, and a lot of it is also told with tongue firmly in cheek. But it’s still a lot of fun, and often laugh-out-loud funny, so it hooked me from the start. This issue features Betty the Hobbit thief (did I mention it’s D&D inspired?) finding out who set them up, leading to a showdown, and then another showdown as the ramifications of their adventures come home to roost. It’s a lot of fighting, much of it pretty bloody, but if you can deal with that stuff it’s also entertaining and humorous. Writer Kurtis J. Wiebe is probably best known for Peter Panzerfaust, a World War II era tale that takes its cues from Peter Pan, but so far I think Rat Queens is the better book of the two, with more humor, better-defined characters, and more structure to its story. I also prefer the art of Roc Upchurch here to that of Tyler Jenkins on Panzerfaust; Upchurch’s style reminds me a lot of that of Fiona Staples (currently getting rave reviews for Saga), but I like Upchurch’s art better than hers, too, although both of them suffer from a paucity of backgrounds. I think Upchurch also does the colors, and I think his lines would be better served by brighter colors. So the series has gotten off to a strong start, but I’m hoping Wiebe and Upchurch have plans to develop it beyond the humor and fighting. For example, we don’t have a strong sense of the main characters beyond Betty, and a series of escapades is going to get repetitive quickly. There’s a lot of potential in the characters and the set-up here, and I hope they’ll develop it, because that will be the difference between being an enduring series and being just an amusing diversion.